A friend of mine just learned she'll start fostering two young girls in a few days--after years of planning and months of waiting, she's now experiencing those moments of sheer terror we all feel when we realize we're about to become parents and we have NO idea what we're doing. Her story got me thinking about what I've learned as a mom and what advice I have to give (not that she needs it or even that she asked for it). So, here you go. My totally unsolicited parenting advice. 1. Establish routines organically and from the very beginning. Structure is key. 2. It's good to give them choices, but limit the choices to things you're ok giving them. 3. No dyes, no processed food. If you don't have it, they won't expect it, and life's a whole lot better without that crap. 4. Have plenty of band aids, preferably ones with pictures. 5. Don't assign chores. Instead, instill a sense of team and working together for the good of the family. 6. Teach them to see what needs to be done around the house and to do it. Mine come into the kitchen and help get things on the table without being asked. It's heavenly. 7. Remind them how lucky they are to have each other. Sometimes this keeps them from trying to kill each other, but not always. 8. You can really never have too many books, sketch paper, crayons or markers. But you can have too many toys that make noise. Some of the kids' books. 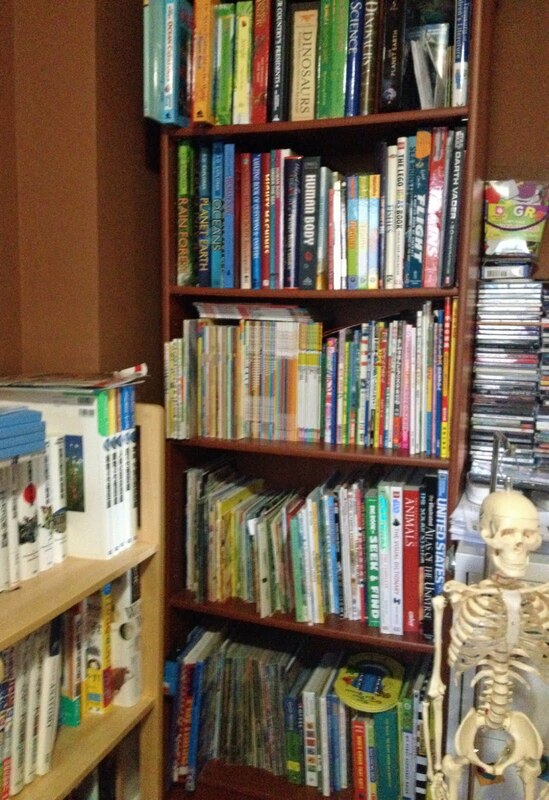 You can never have too many books, but you can definitely have too many skeletons. And even Stow has his own set of books to tear up read. 9. Praise and encouragement go a long way. So does giving your kids the benefit of the doubt. 10. If you feel like you're completely out of your element and that you're flying by the seat of your pants, you're in good company. That's how we all feel, all of the time. Or at least most of it. This is what happens when Sky gets his hands on some markers and some paper. (obviously I'm a newbie here, combing the archives- hi!) Really, really great list! But how do you accomplish #6? I can't even get them to notice toys on the floor that they're about to step on as they run pel-mel through the house! It takes consistent nagging at first and then the development of a sense of teamwork. Also, we have a clean before screen rule, so they can't watch tv, play video games or use the computer if things aren't picked up. Also, I will often ask one kid to help pick up another kid's stuff and then reward them with a magnet (they collect magnets in order to get a prize). When they do things out of the ordinary, I reward them. Otherwise, I don't. So, I don't reward them for making their own beds but I do reward them for helping each other. Over time, they've developed an understanding that we all work together to make things go smoothly.